Making original jewelry enables you to create one-of-a-kind pieces using distinctive beads and gems. 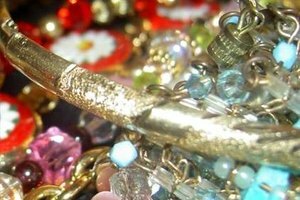 After designing and making a necklace or bracelet, choose a clasp that fits the overall feel of the piece. For a necklace with small-scale beads, consider a barrel clasp. Better suited for necklaces because it requires two hands to open and close, the barrel clasp has a small hole on each end through which you thread the beading string. Knot the ends of the strings inside the barrel clasp to make hidden knots. Determine the length you want to make your necklace and add 4 inches. Cut the beading string to this length. Tie a small double knot in one end of the beading string and place one dot of glue on the knot to set it. Allow the glue to dry completely. Unscrew the barrel clasp so you have two separate halves. Set one half aside. Insert the unknotted end of the beading string into the large end of the barrel clasp half and pull it through the other end until the knot rests inside the barrel. The knot should be large enough to stay inside the barrel without slipping through the smaller hole, thus hiding the knot inside. Add beads to the beading string in whatever design you desire. Leave about 3 to 4 inches of excess string for knotting. Place the second half of the barrel clasp onto the beading string, inserting the string through the small hole first and pushing the barrel clasp along the string to sit right beside the beads. The excess string should extend out the larger end of the barrel. Tie a double knot in the string, making the knot as close to the inside of the barrel as possible. Use the tip of a straight pin to push the knot inside the barrel, if necessary. Place a dot of glue on the knot hiding inside the barrel and allow the glue to dry completely. Trim off any excess beading string with the scissors. If a barrel clasp has a metal ring on each end, clip these rings off with a wire cutter to leave a small hole on each end for threading the beading string.